Should causing a car accident from texting and driving warrant punitive damages under California law? Why are so many car accidents caused by texting and driving and does California law prohibit the practice? The statistics are startling. It is estimated by various studies conducted and/or examined by the U.S. Centers for Disease Control (CDC) that there are over a thousand people every day injured and 8-10 killed every day in the United States by drivers distracted by cell phone use. According to the National Highway Traffic Safety Administration (NHTSA) 80 percent of accidents and 65 percent of near crashes are the result of some type of distraction which takes the drivers eyes off the road, their mind off of driving and / or their hands off the steering wheel. The problem is particularly acute with teenage and young adult drivers which were already a vulnerable segment of society with estimates of one third of all deaths occurring between age 15-20 coming from motor vehicle accidents. 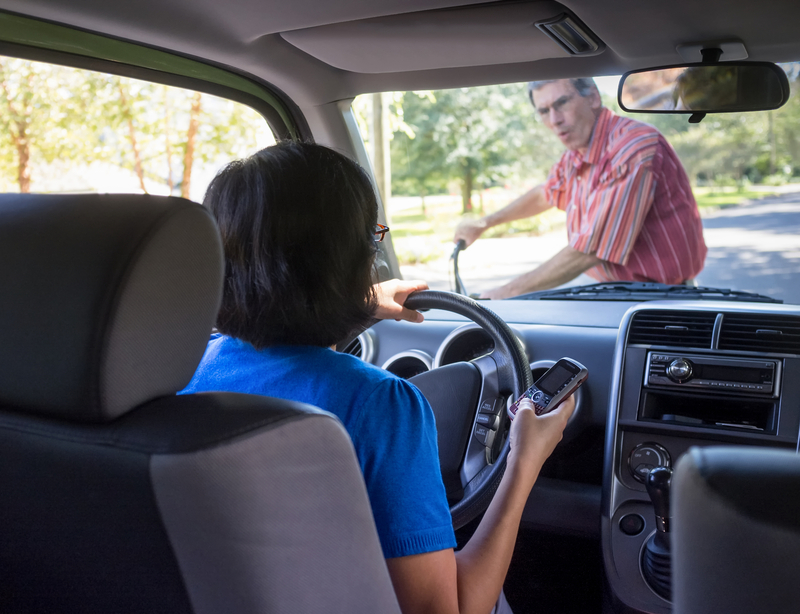 However, it is not limited to young persons in that various surveys estimate that between 35 and 50 percent of adults have admitted to using their mobile device while operating a car. For these reasons, 41 states, The District Of Colombia, Puerto Rico and the U.S. Virgin Islands have all passed laws which prohibit drivers from using a cell phone to send emails or text messages while operating a motor vehicle. California passed such legislation in 2008 and 2009. California Vehicle Code §23123, prohibits all drivers from using a wireless telephone unless they phone is equipped with a hands-free feature such as bluetooth except in emergency situations. California Vehicle Code §23124 prohibits all persons under the age of 18 from using a wireless device even if it it equipped with a hands-free feature except for emergency purposes. These provisions provide for penalties including fines for violations. What are punitive damages and when are they warranted under California law? Punitive damages are additional monetary penalties which can be awarded in civil claims for personal injuries and certain other civil actions. The purpose of punitive damages is to punish the defendant for particularly egregious conduct and to deter them from engaging in similar conduct in the future. The standard for when it is appropriate to award these so-called “exemplary” damages is set forth in California Civil Code §3294 which states that a defendant can be ordered to pay additional money as a punishment when they engage in conduct which constitutes “oppression”, “malice”, or “fraud.” Malice is defined as conduct intended to cause injury to another person and oppression is defined as, “despicable conduct that subjects a person to cruel and unjust hardship in conscious disregard of that person s rights.” This requires that the plaintiff prove that the defendant engaged in this level of wrongful conduct by a higher standard of proof, namely, “clear and convincing” evidence which is more than the “preponderance of the evidence” standard applicable to proving simple personal injury negligence warranting an award of medical expenses, property damages and pain and suffering. The most common scenario where punitive damages are awarded with regard to auto accident claims is driving under the influence of alcohol or drugs, which has been interpreted by California courts to be a sufficient “conscious” and deliberate act showing a disregard for the “rights and safety” of other drivers to warrant punishing the intoxicated motor vehicle operator with additional damages. This begs the question, “Doesn’t trying to drive while using a cell phone also show a conscious disregard for the safety of other drivers?” Various recent studies show that, with equal driving conditions, the impairments associated with attempting to operate a motor vehicle while using a cell phone can be as much or more than driving drunk. This is a question which I assume the California courts will address in the very near future.